Well, like Nathan said recently, it's Christmas time, so we best be gettin' on to to reviewing all sorts of holiday treats. To me, Christmas season begins with Advent, ends on Epiphany, and interrupts itself whenever I hear the opening chords of "Christmas Shoes" - I just can't help but get mad at that grifting little kiddie conniver, the many faces of Rob Lowe be damned. No matter, to me, this is the time of year that Trader Joe's shines brightest of all, with all those holiday goodies - thanks for putting them in the produce aisle this year, forcing me to walk by them, by the way. Good thing my cohort got to review the gingerbread pancakes first, though - those were a disaster awaiting re-experimentation in our test kitchen here. Taste was okay, occasionally a little too heavy on the ginger as mentioned, but man, with following instructions carefully, they were a runny mess that stuck to our pans, and believe me, we know how to cook pancakes. Meh. 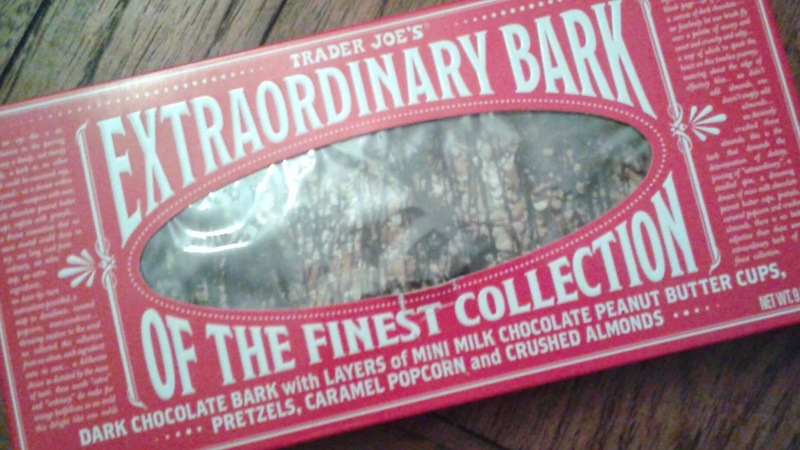 On to Trader Joe's Extraordinary Bark of the Finest Collection. What a goofy, overly honorific, and pretty much unearned name. There's nothing all that special here. Okay, so dark chocolate...I've been getting more and more used to the darker stuff recently (Lindt's 90% bar? Love it!) 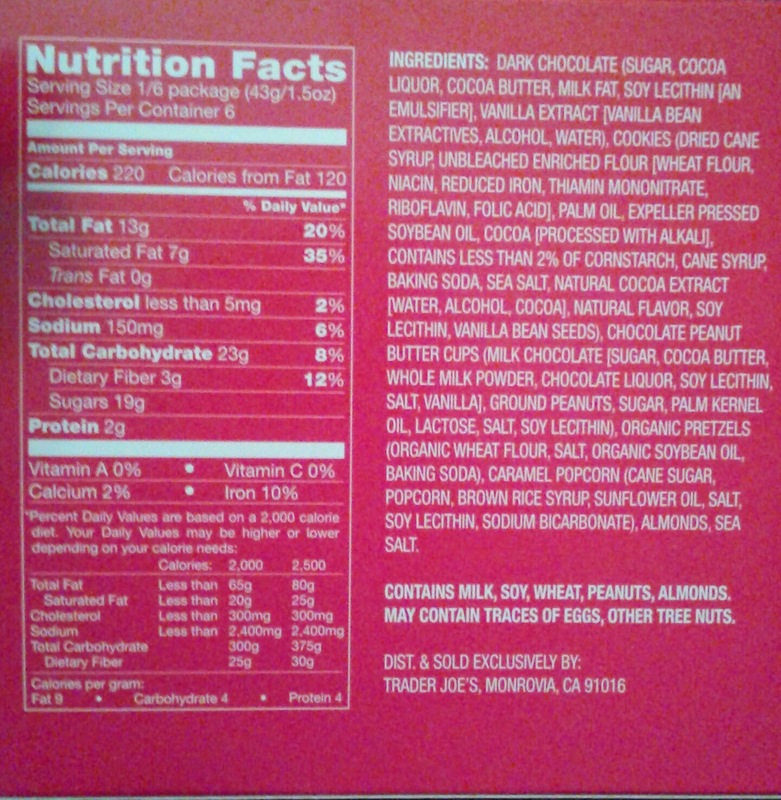 so the chocolate base layer actually tastes a little too sweet to me. Take that for what it's worth, my scale might be whacked. That's not the problem here. No, the issue is with all the little stuff added on. And I do mean "little". There's a billion itsy bitsy almond and pretzel shards, which is okay but kinda run-of-the-mill by itself. All the other stuff, like the mini peanut butter cups, and popcorn, and the unlabelled-upfront-but-definitely-there Joe-Joe cookies? Few and far between. There were maybe four or five Reese knockoffs in the entire six serving bar - not good enough. A few more of those, and a couple more bites of cookie, and more than three pieces of popcorn would have been pretty good. Although, I'd personally kick off the Joe-Joes altogether and get more PB cups and popcorn on there, because the barky bites with those, with the little added crunch of the nuts and pretzels, and if the cocoa-drizzle on top were just right - mmm mmm mmm mmmmmm. Those were good, not "too much" on there, and certainly not too little either. The entire package needed to be like that, not just a few choice morsels in an otherwise sparsely chunkified choco-wasteland. The repeat purchase potential for this extra ordinary (definitely not extraordinary) product depends completely on the level of effort I wish to bring forth to the next office holiday food day - that is, if I wish to bring something more than my usual case of ginger ale but lack desire to much more than plunker down another four bucks. For the first seasonal foray into the world of TJ's Christmassy treats, both Sandy and I were a little disappointed, but in the end not overly, I guess, and I guess we're just gonna have to keep on going back. Got a particular holiday treat we need to get our grubs on? Recommend away! Would love to see a review of the jingle jangle, in a round tin. The description makes it sound like the best parts of the ordinary bark, with none of the "meh" to kill the buzz!